Place large or heavily items on the bottom rack, ensuring the spray arms are still able to spin. Glasses and less soiled items should be placed on the top rack. Position utensils in the cutlery basket soiled end up, except for sharp knives which should be facing down. Avoid overfilling the dishwasher. Overfilling will prevent water from getting to where it needs to go. It also increases the risk of dishes getting chipped. Remove any leftover food or sauces from your pots and plates before putting them into the dishwasher. This will reduce the risk of blockages and unpleasant odours occurring, as explained by Smeg. Insufficient or no salt – check salt levels by undoing the salt cap. If the salt holder is empty or running low, top it up by following the advice in the video below. Clogged Filters – when the filter becomes clogged the cleaning power of the appliance is reduced. A simple and quick clean of the filter will rectify this. 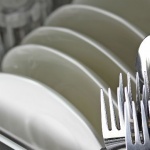 Dishwasher needs a clean – your dishwasher will need to be cleaned to keep it working to its full potential. Failure to clean the dishwasher will reduce its effectiveness.To thoroughly clean your dishwasher, put it through a maintenance wash and include a limescale and detergent remover. 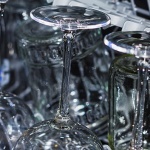 The list of faults which can occur with dishwashers is extensive and how you diagnose each fault will vary. However, for common faults you’ll be able to find the answers on how to fix them in our advice centre, which provides the information you need to diagnose and fix faults yourself. Dishwasher Door that Slams Open? Have you got an integrated dishwasher in your kitchen with a door that slams down when you open it and leaves your crockery and glassware quivering?